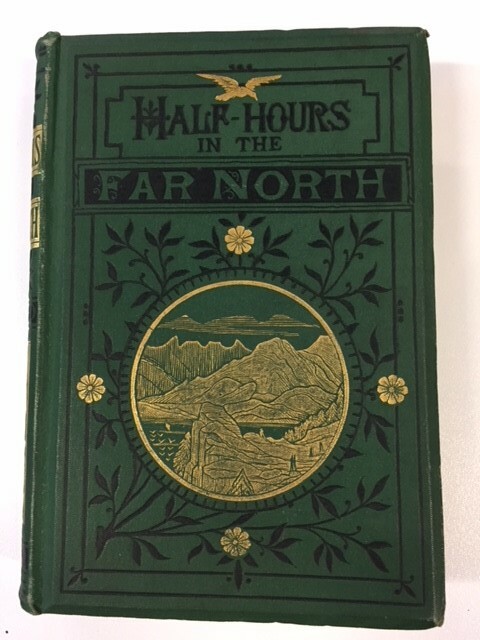 I found this attractive green and gold volume entitled Half-Hours in the Far North: Life amid snow and ice in the Canterbury Christ Church University Special Collections. It was published in 1881 by William Isbister of Ludgate Hill, a Scottish publisher who had started his career working for Alexander Strahan. The book is a lively account of a series of voyages to Iceland, Northern Russia, Greenland, Orkney, Shetland, the Arctic Seas and Norway including ethnographical, geographical and ornithological descriptions. It is part of a series entitled The Half-Hour Library of Travel, Nature and Science which includes titles on sport and travel, the Deep, the Far East, insects, and the Tropics. The series includes high-quality illustrations but several of the books are uncredited. The titles were aimed at young readers and ea ch volume cost 3s 6d. 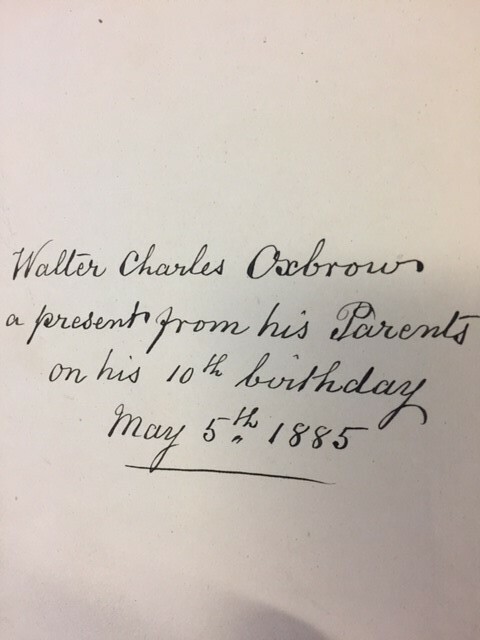 This copy was given to Walter Charles Oxbrow on his 10th birthday on the 5th May 1885. Walter lived at 35, Burgate, Canterbury, three doors away from the Cathedral gate, with his parents and his older brother, Alfred. [i] His father owned a watch and clockmakers. Adverts from the time reveal that the shop also sold jewellery, optical and electro-plated goods. [ii] Across the street from their shop was Austen’s, a bookseller and stationers, and it is possible that the present was purchased there. Walter would have no doubt marvelled at the stories of adventures in foreign lands: tales of Eskimos, dog-sledges, fiords, glaciers and the aurora borealis. I was curious to know more about the voyages described in the book and how they might have influenced their young reader. In order to do this, I decided to work out who had written the account. How hard can this be, I thought? I was about to find out. I started by looking for information about the publisher William Isbister. I quickly uncovered an article on JSTOR written by Bradford Booth entitled: ‘Author to Publisher: Anthony Trollope and William Isbister’ Princeton University Library Chronicle 24 no.1, 1962. In it, I discovered that Isbister’s letters and papers are held at Princeton University and include 48 letters from Anthony Trollope, who having retired from his job in the Post Office, was supplementing his income writing travel books, biographies and articles. [iii] I got widely excited when I read that Trollope had been to Iceland in June 1878, and wondered whether he contributed or indeed had written Half-Hours in the Far North, but with further research I learned that Trollope had written an account of his voyage entitled How The ‘Mastiffs’ Went to Iceland which was published by J.S. Virtue and Co. in 1878. 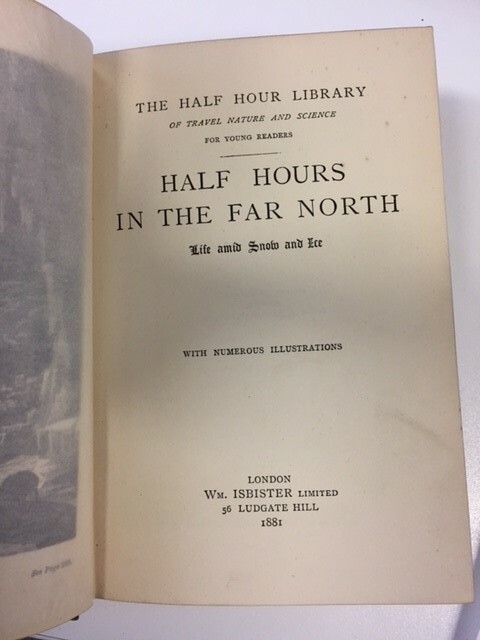 I still naively clung to the hope that Trollope was the author of Half-Hours in the Far North. However, on reading the account of the voyages in both books I realised I was barking up the wrong tree. The voyage in Half-Hours begins at Liverpool docks on a calm evening, the Mastiff set off from Castle Wemyss, on the Firth of Clyde. [iv] It was back to the drawing board. Although I knew the author of Half-Hours in the Far North couldn’t be Trollope, I decided to read the Trollope letters in Bradford Booth’s article, as I hoped to learn more about William Isbister. I decided to find out more about Good Words as the reference to “Half-Hours” was too tantalising. Good Words, a periodical containing moral stories and non-fiction designed for a non-conformist audience had been founded in 1860 by Alexander Strahan, Isbister’s former employer. By searching its contents on ProQuest’s Periodicals Collections for articles about Iceland, I was able to find my first clue. 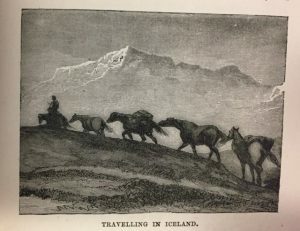 An article entitled A Holiday in the Norse Country written by an author with the initials G.H.B had been published in the January 1864 issue. 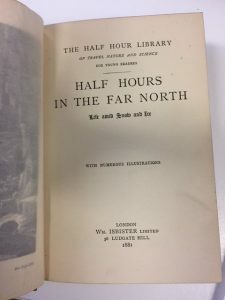 It matched the first chapter of Half-Hours in the Far North word for word. I then searched for articles on Russia and Greenland to see if G.H.B had written those chapters. I was surprised to discover that the chapters were written by different authors. The Russia chapters were originally published as A Peep at Russia and the shores of the Baltic in Good Words in December 1861 by Norman Macleod. Norman had also written the chapter describing the Search for Franklin as The Fate of Franklin in Good Words in December 1860. In the account he mentions that Dr Walker, the ship’s surgeon and naturalist of the expedition, opened a school on board ship. 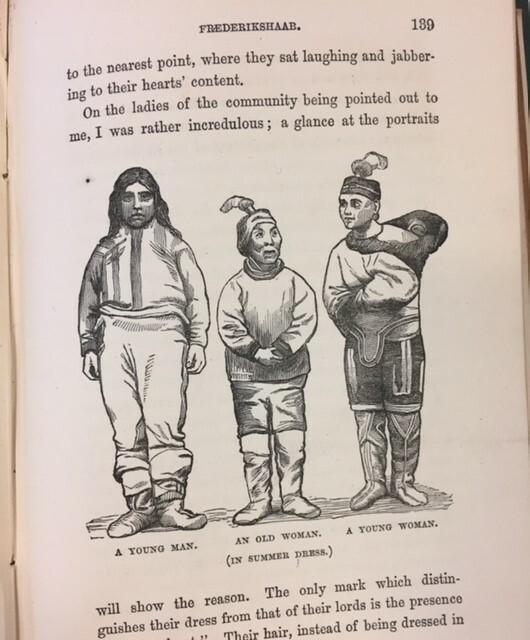 By searching for Walker, I was able to discover David Walker’s account of the journey Days and Nights in Greenland which was published two years later in the December 1862 issue of Good Words. 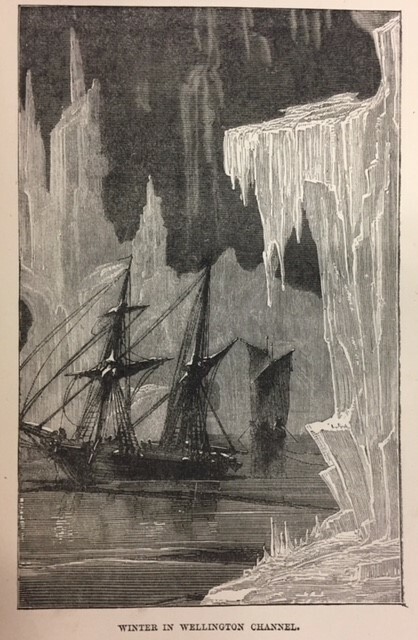 His article provided the text for the chapters on Greenland in Half-Hours in the Far North and his photographs from the expedition were used to illustrate the book. I noted that Norman Macleod was also the editor of Good Words and decided to find out more about him. He had a younger brother George Husband Baird Macleod, a Glasgow surgeon. I had found G.H.B. 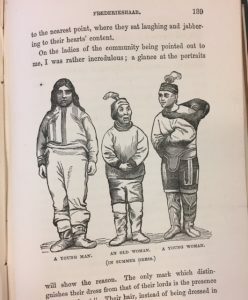 I decided to find out more about who owned the copyright of the chapters in Half-Hours in the Far North. Norman Macleod, who had written the Russia chapters, died in 1872 and Good Words continued under the editorship of his brother Donald, with Messrs Daldy, Isbister and Co as publishers. In 1878, William Isbister bought up the copyright of Good Words, the Sunday Magazine and portions of the school books and other publications formerly issued by Messrs Daldy, Isbister and Co for £30,000. [ix] Half-Hours in the Far North had been published earlier it seems in November 1875 and so would have been part of this purchase. [x] With literacy levels rising, children’s fiction was a growing market. Surely Isbister was on to a winner? Nevertheless, it seems extraordinary to the modern reader that a publisher would not capitalise on the name of a popular author. Was Isbister really such a poor business man as Trollope claimed? In another title in the series, Half-Hours in the Far South: the people and scenery of the tropics published in 1877, a chapter about the island of Monos is taken from Charles Kingsley’s Letters from the Tropics published in the May 1870 issue of Good Words. Kingsley, author of the popular children’s book Water Babies published in 1863 had died in 1875. Once again, like Ballantyne, Kingsley was a well-known author yet his work is uncredited. Isbister owned the copyright to four of Kingsley’s books: Madam How and Lady Why, Health and Education, Town Geology and Selections from Writings. He could not have been ignorant of the money that could be made from Kingsley’s writings. 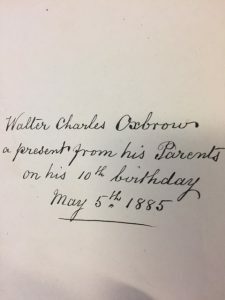 As for Walter Oxbrow, we do not know what he thought about his book, only that it survived the passage of time, but we can imagine that the stories were exciting for a boy living in a small city. By the age of 15, Walter had gone to sea, leaving his brother working in their parents’ shop. Walter sailed as a ship’s apprentice to New York, Mauritius and Sydney, working for the Bay Line Shipping Company, receiving his certificate of competency as a second mate just before his twentieth birthday. He continued in the merchant marine until 1901 when he joined the Imperial Yeomanry to fight in the Boer War, returning to the sea afterwards. Walter’s adventures were to take him all over the world. You can see a digital copy of Half-Hours in the Far North at the Internet Archive. It was published by Dodd, Mead and Company in America in the 1870s. The bookplate of the digitized copy reveals an interesting story in itself, as it is signed and dated by Raymond B. Montgomery (1910-1988). Raymond was raised in Falmouth, Massachusetts where his mother Priscilla was a librarian at the Marine Biological Laboratory. He later became a scientist on the RV Atlantis and professor of Oceanography at John Hopkins University. Raymond Montgomery was ten years old when he wrote his name in his copy of the book. The same age as Walter Oxbrow when he was given this book 25 years earlier. Two ten year old boys deeply inspired to travel and adventure by the stories of an earlier era, of stormy seas and purple coasts, who unlike me, probably didn’t care a straw about who authored the book. Michelle Crowther is the Learning and Research Librarian for Humanities and Languages. The Library is currently looking for volunteers to work with our archives and special collections so if you are interested in uncovering the stories behind the books, please register your interest at the library point in Augustine House. [i] “England and Wales Census, 1881,” database with images, FamilySearch (https://familysearch.org/ark:/61903/1:1:Q27W-N3C7 : 11 December 2017), Walter C Oxbrow in household of Alfred Oxbrow, Canterbury St Andrew, Kent, England; from “1881 England, Scotland and Wales Census,” database and images, findmypast (http://www.findmypast.com:n.d.); citing p. 15, Piece/Folio 959/94, The National Archives, Kew, Surrey; FHL microfilm 101,774,443. [v] Bradford A. Booth, ed., The Letters of Anthony Trollope. (London: Oxford University Press, 1951), 462 cited in Booth, and Trollope. “Author to Publisher: Anthony Trollope and William Isbister.” The Princeton University Library Chronicle 24, no. 1 (1962): 51. doi:10.2307/26402714. [vi] Donald Macleod, Memoir of Norman Macleod, D.D. (Toronto: Belford brothers, 1877), 28. [vii] . Donald Macleod, Memoir of Norman Macleod, D.D. (Toronto: Belford brothers, 1877), 28. [viii] Bradford A. Booth, ed., The Letters of Anthony Trollope. (London: Oxford University Press, 1951), 462 cited in Booth, and Trollope. “Author to Publisher: Anthony Trollope and William Isbister.” The Princeton University Library Chronicle 24, no. 1 (1962): 51. doi:10.2307/26402714. [ix] Cornish and Devon Post, September 14, 1878, and October 12, 1878. Gale (accessed March, 29, 2019). [x] “List of new books,” The Athenaeum, 2508 (1875): 672-3. ProQuest (accessed March, 29, 2019). [xi] W. F. Butler Far out: rovings retold. (London: Isbister, 1880),vii. [xii] “The Half-Hour Library.” The Relinquary: quarterly archaeological journal and review, July 1863-Oct.1894 21 (1881): 188. ProQuest (accessed March, 29, 2019). [xiii] Bradford A. Booth, ed., The Letters of Anthony Trollope. (London: Oxford University Press, 1951), 462 cited in Booth, and Trollope. “Author to Publisher: Anthony Trollope and William Isbister.” The Princeton University Library Chronicle 24, no. 1 (1962): 51. doi:10.2307/26402714. [xiv] St James’s Gazette, January 28, 1890. ProQuest. (accessed March, 29, 2019). [xv] The Western Times, April 22, 1876. British Newspaper Archive (accessed January 29, 2019). [xvii] Matthew Arnold, “Copyright,” Fortnightly Review, 159, March, 1880, cited in King, Andrew and John Plunket. Victorian Print Media: a Reader. (Oxford: Oxford University Press, 2005):110-118.